Football for the over 50's in Fleetwood and the Wyre Borough has been going for a number of years. Our Club aims to promote health and wellbeing for those over 50 and to encourage participation in physical activity through walking and senior football. 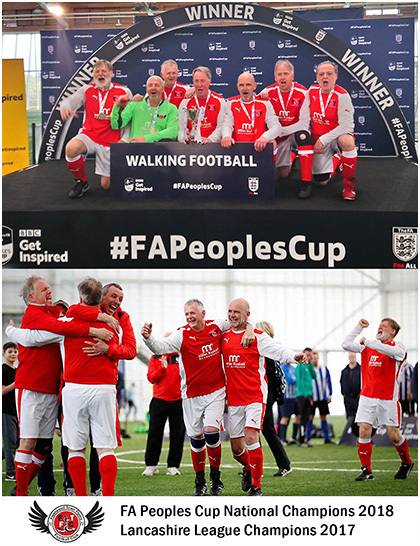 We offer fun, friendly football and we also have teams that compete in competitive local and national walking football events, leagues and tournaments with our over 50's squad being the 2017 Lancashire League Series Champions who also secured the title of 2018 FA Peoples Cup National Champions at St Georges Park, FA headquarters in April 2018. Participation and membership numbers continue to grow and in March 2016 Fleetwood Town Flyers FC was formally constituted as a Club with its own Management Committee. Our home ground is at the, top quality Poolfoot Farm Sports & Leisure Village in Thornton, Lancashire where we now hold a number of over 50's football sessions throughout week and we enjoy excellent support from the complex itself, the Fleetwood Town FC Community Trust and Fleetwood Town FC. A grant from the Big Lottery Fund enabled us to develop our sessions in partnership with the coaching staff from the Community Trust. We also receive some tremendous support from Miller Roskell Accountants based in Thornton-Cleveleys who are our official kit sponsor. We have a hard working Management Committee overseeing the running of the Club, with fantastic support from our partners and most of all we have a great bunch of enthusiastic members who are thoroughly enjoying their football with the Flyers! Come and join us at one of our sessions and give Senior or Walking Football a try....you won't regret it! We currently hold a number of football sessions per week at Poolfoot Farm played on 4G artificial grass which are open to anyone over 50 years old with a warm friendly atmosphere awaiting all new players. If you wish to get involved your first session is FREE ! and then it is just £3.00 per session. Please contact us before attending a session if you would like to discuss which sessions would be best for you. This walking football session is held on open 4G pitches with sidelines and is our main 'football for all' session. It is suitable for players of all abilities and fitness levels making it ideal for all first time players through to experienced players.This is the best session to attend if you are a new starter. This senior football session is held on an open, 4G pitch with games being played at a much quicker pace (running, not walking) It is therefore mainly suited to the fitter, more mobile, higher ability players who wish to play a running game. Fleetwood Town Flyers are also heavily involved in competitive walking football boasting both an over 50's and an over 60's squad. Both teams regularly take part in major national and regional tournaments and also play competitive friendly matches. This competitive form of the sport is played to the FA Laws of the game with matches lasting between 15 and 30 minutes. The standard of play is higher and more intense than our regular sessions and so requires a certain degree of ability, tactical awareness and fitness making it ideal for people who have experience of playing regular football and would like to get back to playing the sport they love but at a slower pace. With our football sessions being held at our base at Poolfoot Farm all players have access to the excellent facilities and a warm, friendly atmosphere awaits new players. 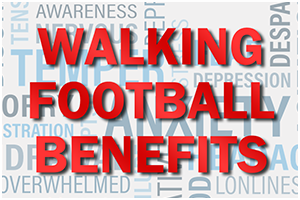 Walking & Senior football are enjoyable forms of exercise for the over 50's and are proven to provide many physical and mental health benefits for participants whilst helping to reduce social isolation. 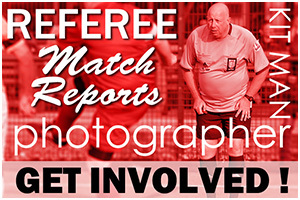 Whilst the focus of our Club and walking football in general may appear to be focussed on providing football for the over 50's with a view to improving fitness and wellbeing through football, our Club and the sport in general also serves another, perhaps less obvious but equally important purpose to many over 50's.